Wisconsin lumberman Joseph Bailey is best known for his ingenious engineering feat that saved a Union fleet during the Civil War's Red River Campaign. Joseph Bailey was born in Ohio and spent his youth in Illinois. He moved to Wisconsin about 1849, settling in Columbia County where he claimed land along the Wisconsin River a few miles below the present site of Wisconsin Dells. Here he worked in the lumber industry and promoted the village of Newport as a prospective crossing for the approaching La Crosse and Milwaukee Railroad. The bridge site, however, was secretly changed to a nearby location at Kilbourn City (modern Wisconsin Dells). Within a few years Newport was a ghost town. Bailey and his supporters moved their interests to Kilbourn City. 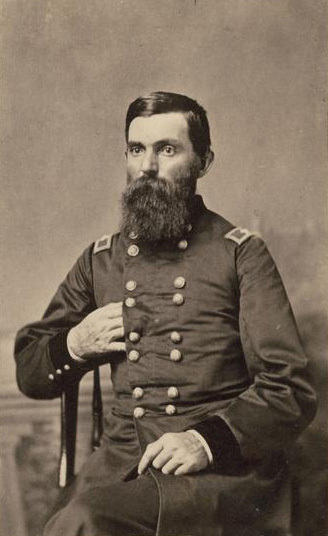 After war broke out in 1861, Bailey organized a company of recruits known as the "Columbia County Rifles" (Co. D, 4th Wisconsin Infantry) and was elected its captain. His company worked chiefly as engineers constructing barracks, canals, bridges, and levees. They were frequently detached from the 4th regiment to support other commands. His work crews usually consisted of escaped or former slaves who had joined the Union cause. In 1862 Bailey directed the crew attempting to dig a canal through land near a U in the Mississippi River to bypass Confederate guns from Vicksburg, Mississippi, and to facilitate a Union attack on the city. In May 1863 he led a charge at the Battle of Port Hudson, where his team had been constructing the siege works. For his efforts at Port Hudson Bailey was promoted to lieutenant colonel. Bailey's military fame derives from his creative actions during the failed Red River Campaign of 1864. Union forces had traveled far up the Red River into Louisiana and Texas on a fleet of 32 gunboats. When Confederate troops forced the Union expedition to pull back, the fleet found itself stranded by low water above the Alexandria Rapids and was in danger of capture. Bailey proposed freeing the fleet by constructing dams similar to the ones used by Wisconsin River lumbermen to raise the water level when logs were stuck on rapids. Utilizing plantation labor, they constructed a dam that enabled the fleet to float safely through the low water. According to General N.P. Banks, Bailey's efforts saved the Union a fleet worth approximately $2 million dollars. During the remainder of the war, Bailey continued to serve as an engineer and led cavalry raids in the Gulf States. In November 1864 he was commissioned brigadier general, and in March 1865 was brevetted major general. After discharge from the army in July 1865, Bailey returned briefly to Wisconsin but soon moved to the town of Nevada, Missouri. Elected county sheriff, he was murdered on March 26, 1867, while arresting two suspected bushwhackers. Written by Albert Bigelow Paint explaining the Red River Dam episode, from "McClure's Magazine," 1895.